Seven and one half decades ago Mrs. E. Gillig Betz of Philadelphia and Mrs. J. Raymond Price of Pittsburgh had a conversation that resulted in the formation of the Pennsylvania State Women’s Golf Association. On February 3, 1932 the association was formed by representatives of the Women’s Golf Association of Philadelphia, the Women’s Central Pennsylvania Golf Association, and the Women’s Golf Association of Western Pennsylvania. Officers elected were President Miss Florence McNeely, Philadelphia Country Club, Vice President Mrs. J. Raymond Price, Oakmont Country Club, Secretary-Treasurer Mrs. E. Gillig Betz, Philadelphia Country Club. Three representatives from each association comprised the Executive Committee. The first Amateur Championship was held at Aronimink CC in 1933. A few notable golfers of the day were listed in the original program from 1933. Helen Stetson, Glenna Collett Vare, Dorothy Campbell Hurd, Mrs. Clarence Vanderbeck. The list also included four former national champions; Francis Williams, Edith Quier (Reading), Mrs. J. Raymond Price, Sarah Fownes Wadsworth (Pittsburgh). The trophy, a beautiful English cup, was presented by the Golf Association of Philadelphia. It is still in use today. Today the Pennsylvania State Women’s Golf Association is an organization that is comprised of approximately 150 member clubs. The structure remains much like it was designed in 1932. To encourage equal representation the state is still divided into three sections: East, Central and West. Each division has three representatives or directors that are elected for a three-year term. A President, President-Elect, Secretary and Treasurer comprise the Executive Board and serve two-year terms. The President–Elect continues on to become President after her initial two year term. Every year the Eastern, Central and Western divisions host a fun day for junior girls and a Four-Ball stroke play tournament. The Women’s Amateur (1933), Senior (1970) and Super-Senior (1996) Championships are played at match play and are all held at the same site. In 1990, the Amateur and Senior were played at stroke play due to a scheduling issue at Lancaster Country Club. Championship sites rotate across the state from year to year. The Junior (1955-58, 1968) and Junior-Junior (2007) Championships are stroke play events and also rotate throughout the state. Approximately 500 girls and women participate in our tournaments each year. In our 75 years from 1933 to 2011 (event did not take place 1942-1945 due to WWII) the PSWGA Amateur Championship has been played on some of the finest courses in the state. Merion GC has hosted the most Amateur Championships at five while Oakmont CC, Pittsburgh Field Club, Allegheny CC, Gulph Mills and the Country Club of York have each hosted four. Allegheny CC, Fox Chapel GC, Hershey CC, Huntingdon Valley CC, The Kahkwa Club, Lancaster CC, and West Shore CC have each hosted 3 Amateur Championships. In 1933 Miss Frances Williams of St. Davids GC, captured the very first PSWGA Amateur at Aronimink CC beating her opponent, Miss Edith Quier of Berkshire CC. Now we celebrate the 75th “birthday” of the Amateur Championship. Many women have contributed to our Pennsylvania State Women’s Golf Association history! Pennsylvanians have made a mark on Curtis Cup history as players and as Captains. Judy Oliver (’78,’80,’82) Honorary Capt 1992. Noreen Mohler (’78) Capt 2010. Carol Semple Thompson’s illustrious and unparalleled career includes an amazing record for Curtis cup appearances. She has played in twelve Curtis Cups (’74,’76,’80,’82,’88,’90,’92,’94,’96,’98, 2000, ’02) and then captained the U.S. team in 2006 and 2008. In 1995, Pennsylvania sent a women’s state team comprised of Carol Semple Thompson, Judy Oliver and Liz Haines to participate in the inaugural USGA Women’s State Team Championship held in Lake Buena Vista, Florida. This tournament grew out of the United States Golf Association’s Centennial celebration and was fashioned after the biennial World Amateur Team Championship. With Judy Cooke as Captain, our Keystone ladies won the competition by one stroke over the Lone Star State, Texas! Carol Semple Thompson played on 8 consecutive teams and then captained the 2011 team. Liz Haines has competed in six team championships. We have finished 1st, 5th, 3rd, 9th, 6th, 22nd, 27th, 12th , 18th, 27th 3rd and 20th an impressive record. The event was held every other year and discontinued after the 2017 event. Carol has won seven USGA Championships – Women’s Amateur (1973), four consecutive Senior Women’s Amateur titles (1999-2002) and two Women’s Mid-Amateurs (‘90,‘97). She won the 1974 British Ladies Open Amateur and played on five USGA Women’s World Amateur Teams. In 1994, she became only the second woman to serve on the USGA Executive Committee (1994-2000) and still remains an active volunteer. In 2003, the USGA bestowed upon Carol it highest honor for an individual, the prestigious Bob Jones Award. She has competed in more than 100 USGA Championships, becoming the charter member of the “Century Club” in 2005. It is a record that will probably never be broken. The PGA of America named Carol the 2005 First Lady of Golf, an award given to a woman who has made significant contributions to the promotion of the game of golf. In 2008, Carol was inducted into the World Golf Hall of Fame. She is a woman of dignity, integrity, humility and graciousness. Pennsylvania is proud to claim Carol Semple Thompson. She is a true ambassador of the game and her extraordinary career is in a league of its own. In 1970, our Senior Championship was organized by Evelyn Moreland for women 50 years and older. During a trip to England she purchased the current Senior trophy, then donated this unique trophy to the association. Connie Shorb from the CC of York has won the tournament a record ten times. In 1996, a Super Senior championship for women of 65 years and older was added. Sheila Selby and Bonnie George both from Huntingdon Valley have won four titles. Betsy, Debbie and Michele went on to the LPGA Tour. The event was discontinued after 1958, began again in 1968 and continues today with a Junior-Junior Championship being added in 2007 to further encourage participation at all levels of ability. Julia Curley was a double winner (2009-2010). The Herr sisters pulled of a family double with Erica winning in 2011 and younger sister Madelein winning in 2012. Our PSWGA Junior Champions have distinguished themselves on the high school level as well, winning both the Junior Championship and the Pennsylvania Interscholastic Athletic Association Championship. Some winning both in the same year! Only two mother-daughter duos have won both the Amateur and the Senior Championships in the same year. Judy Oliver - Amateur & Evelyn Moreland - Senior (1976) Huntingdon Valley CC. Three players have won both an Amateur title and a PIAA title. Aurora Kan achieved a unique double winning both in the same year. Katie Miller won three PIAA titles before winning her first Amateur in 2007, then repeating in 2015 and 2017. The constitution of the Pennsylvania State Women’s Golf Assoc. states “the object of this organization shall be to encourage friendly competition among women golfers of the State of Pennsylvania and to hold an Annual Championship Tournament and such other events as the Executive Committee shall decide.” Year after year the Pennsylvania State Women’s Golf Association continues to leave its imprint on women’s golf in the Keystone State. The friendships that have resulted out of mutual respect from the opportunity to compete against one another has left memories that will last a lifetime for those fortunate enough to have experienced the competition. The defined objective of the organization, friendly competition among women golfers of the State of Pennsylvania, has stood the test of time and will continue to do so as each generation of women come together and make their own memories. Two women had a conversation seventy-five years ago. As a result of that conversation they set the lifetime course record for women’s golf in Pennsylvania and we are all the better for it! We wish to thank the individual players and the member clubs that have supported our Association through the years. 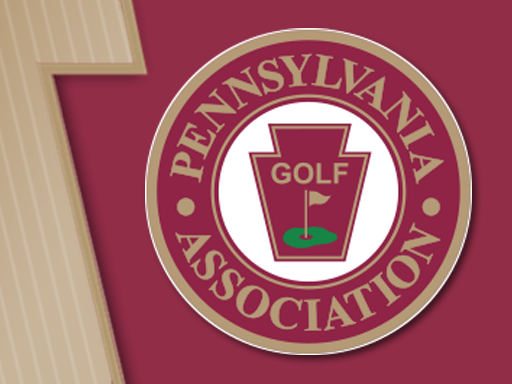 In October 2018 the Pennsylvania Golf Association and the PSWGA unanimously agree to merge. The new board will continue to work for the men and women of Pennsylvania to better serve and promote golf for all players in Pennsylvania.